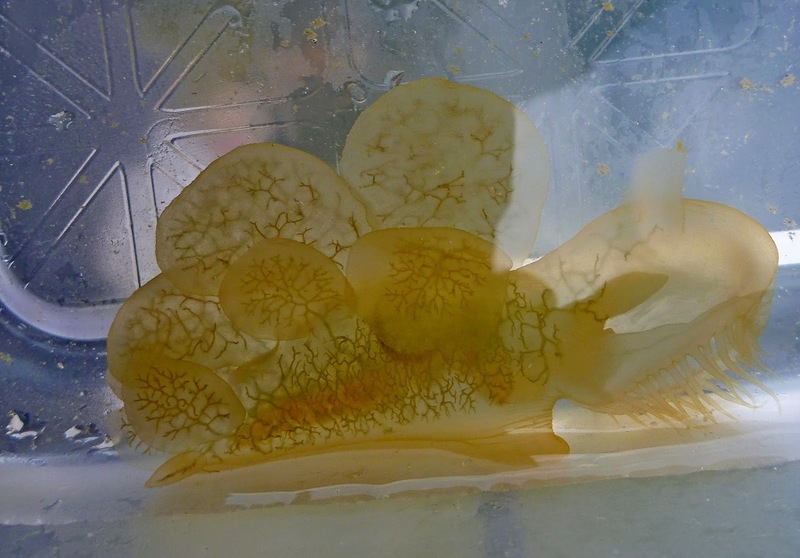 Summer is mating time for Melibe leonina, the Hooded (Lion) Nudibranch in Puget Sound. This unusual sea slug does a lot of swimming from place to place to find mates and food. Food consists of small invertebrates that are captures with an oral hood. Hooded sea slugs usually are found on eel grass and use the oral hood to envelope prey items that live on the surface of the eel grass blades. 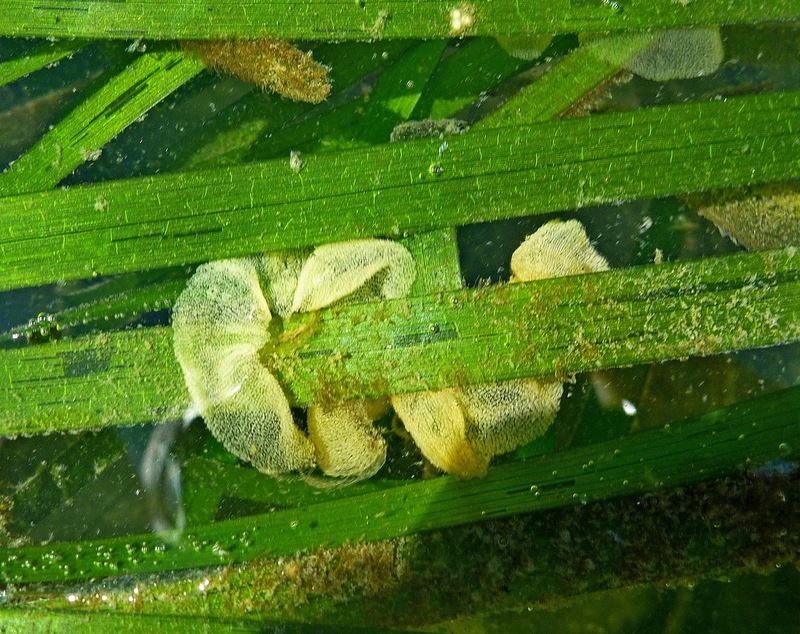 Eggs are laid in ribbons attached to the eel grass or sea weed....often Ulva. They apparently live about one year, reciprocally fertilize one another (hermaphrodite), lay their eggs and die. Melibe produces a sweet fruity aroma when handled and this gives the group name " bouquet". This chemical odor is used to attract others in the hunt for a mate. Many sea slugs produce chemical defenses which make up for the lack of a protective shell, spines or other defenses perhaps this works for the Hooded sea slug. "Predators may include fish, kelp dwelling crabs and sea stars, but when disturbed Melibe leonina has the ability to autotomize (shed) its cerata. This will hopefully lead the would-be attacker away as the discarded appendages float off, or at least cause a distraction long enough for the sea slug to make an escape." The images/video below were taken a Seahurst Park in Burien WA on 8-2-15. Thanks for posting these videos as well as the stills. I'm still looking for my first one of these, and they look a bit different than I expected they would from book photos.